This cable is for use with Darklight / Gantom mini LED fixtures and other brands. If you are not using for a Darklight / Gantom light please let us know with the note at checkout so we can verify the pinout. This is our custom-built 5 pin XLRF to 1/8" (3.5mm) DMX-512 110ohm digital lighting control cable. 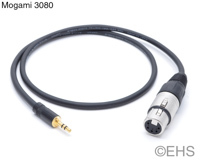 Construction is Neutrik connectors with Mogami 3080 cable. Neutrik connectors are some of the best connectors around, with no screws to fall out after years of abuse. Mogami wire is the best wire, used in the best studios for it's ultimate signal transmission qualities and durability. Mogami 3080 cable is very flexible, durable, light-weight cable, with 25awg twisted pair core and a served shield with drain. What it's connecting to or from, for example "CD out", "Channel 1 In", etc. Photo 2 shows the two ends.